Would love any info on Cizek. I just bought some brochures and will scan them for the Library. Cizek made some great speakers but they seem to be much better known in Italy than here! Would like to hear from more Cizek fans/owners and especially former employees. Hi guys, I'm an enthusiast Cizek lover from Italy since i was teenager on 1984 with my first pair of Cizek Model III. In the last couple of years i worked to find and to buy others in my opinion significant speakers of the Cizek production but it's quite hard to get the items in good and unaltered situation. I will be really grateful to all the friends here and especially to the workers at the main Cizek factory for any help or suggestion in order to restore the factory's condition of these fabulous speakers. Unfortunately the first owner gave the 4 woofers to a maintenance store and they changed the voice-coils and the spiders of these woofers without a serious reason. At this moment the new spiders are too hard and also i think that the new voice-coils are really different from the original. Even the resonant frequency in free air of each woofer at the moment is 16Hz instead of 12Hz as showed in Mg27's specs. I will be really grateful if someone in touch with who worked at Cizek factory can help me to find the original Mg27's spiders and voice-coils. In alternative i will really appreciate to receive just the full specs of the original voice-coils. Thanks to a long work of investigation i found some pictures of Model's 1 woofer voice-coils and the original advertising of these speakers. A secondary matter is the one regarding a special customized improvement done by Cizek factory on the famous Peerless tweeter before to be installed on the speakers. This story still a mistery so i think that just a worker at the factory can help on that. in order to find the right or similar replacement. Thanks to everyone for any help about that. I just emailed an MG27 brochure that has some specs. Thank you so much Kent for your prompt reply. Any additionals information from others Cizek lovers here? 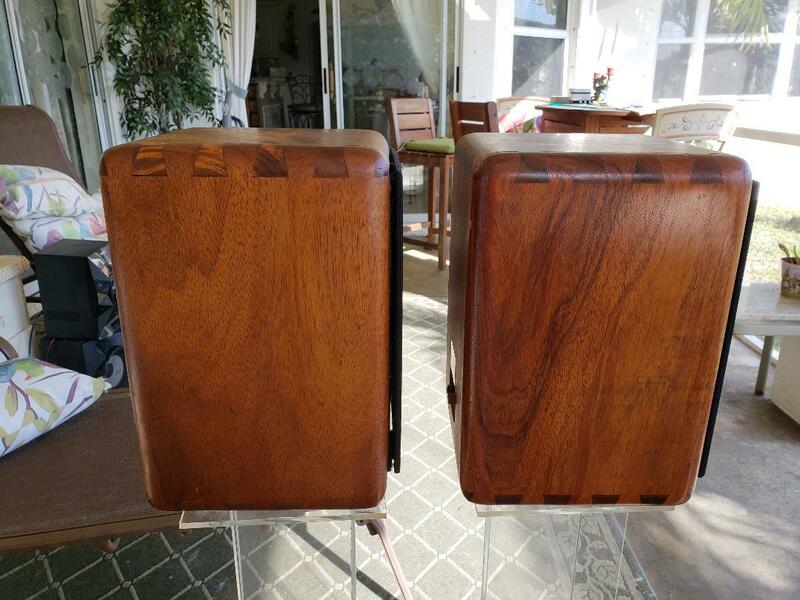 Hi Thrift-flea, pls pls pls can you put me in touch with Mr. Plotkin in order to try to collect really precious technical infos for my restoring work of my old Cizek speakers at my home?? Hi there. Not sure if anyone still checks this forum or this thread but I had to chime in. I worked at Cizek in Andover, MA, then in Lawrence when they moved after Sheldon passed away. I was there when we heard the news of his passing. He was on his way to work and died of a heart attack during the commute. I never met Roy but I answered the phone when Paolo called, although I never met him either. I started out in the factory assembling and soldering the crossovers then worked in the office purchasing transistors, Peerless tweeters, etc. The woofers were made in the factory by my best friend. 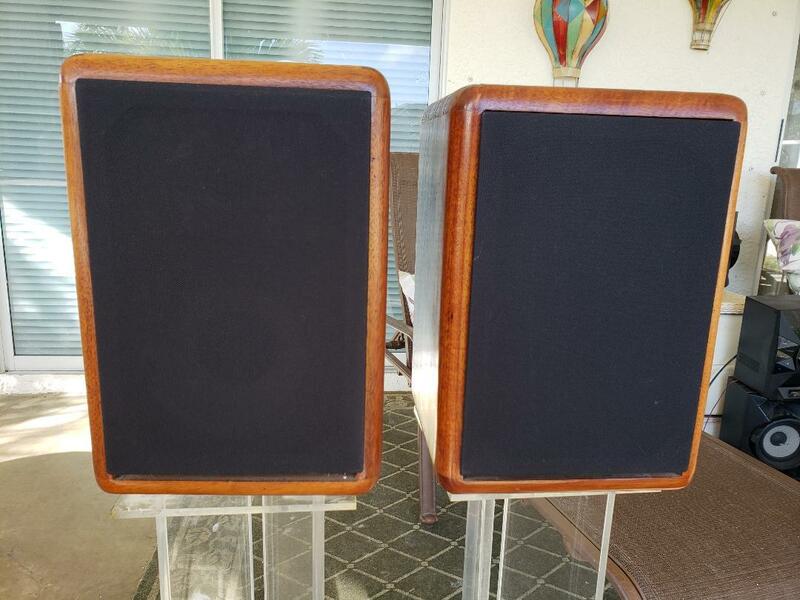 The speakers were stuffed with fiberglass, as all Cizek speakers were. I didn't do that job but I believe it was weighed before final assembly to make sure it was the correct amount. I remember being told it made a big difference as everything in assembly did. I can remember when the koa's were on the front page of High Fidelity Magazine. We were all pretty stoked about that. Free advertising! I may even have a copy of that page. I know I have a copy of the retail price list of all the speakers made at the time. The ka1's sold for $300/each ($600/pair). This was around 40 years ago and although I got a little discount, I remember between the speakers and acrylic stands, it was a big investment when I was that young. 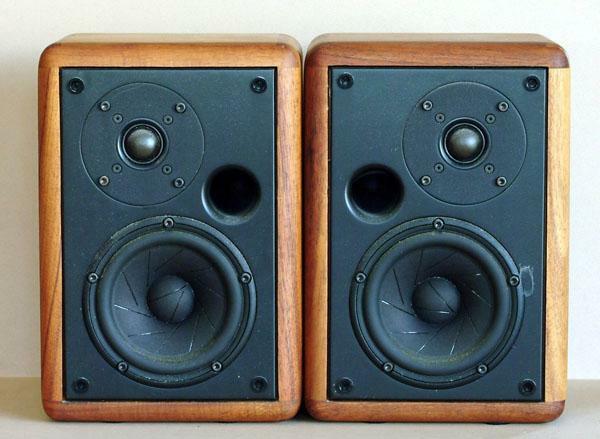 I still own that pair of Koa KA1's, complete with stands that I have babied for decades. I fell upon this forum while trying to research and figure out what to do with them. They would need some restoration but all in all they are in great shape considering their age. One has a replacement woofer while the other still has the original but the foam ring is deteriorating. I had replaced the tweeters at one point as the dome had collapsed. I believe they were replaced with the original Peerless model but not positive. I do not recall anything being done to the tweeters at the factory other than perhaps a coating added to the dome. Pretty much everything else was assembled in house though. It's possible that Peerless may have made them special order. I've also replaced the foam front grills that disintegrated. I found some cloth ones that fit fairly well attached with small strips of velcro in the corners. I remember spinning and testing the inductors. We also tested the resistors and capacitors that were purchased to make sure they were within the stated +/- tolerance levels. I hot glued the parts and soldered the crossovers, which would be meticulously examined by QC to make sure there weren't any cold solder joints. 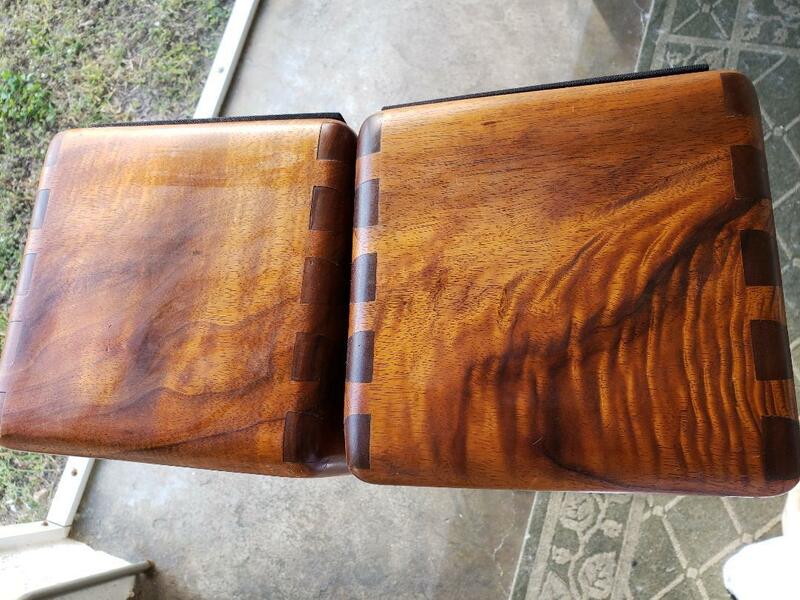 I was fortunate to be able to pick out what I thought were the most beautiful koa cabinets in stock by wetting the wood to see the grain, then I did the finishing work on them with many coatings of tung oil buffing between coats with steel wool which gave them a beautiful satin finish. There was tiny bit of a gloss but definitely not a high shine gloss. The tung oil really brought out the beauty of the wood. That's all they needed. No staining was ever done on them. The grain on the tops of my cabinets almost look like ripples of water, one a bit more than the other. Our factory took time to match the cabinets into pairs as koa wood has a lot of variation of shades and grains. The wood has such a great play of light in the grain. The engineers used to use a sound room for testing to make sure everything was built and assembled to spec likening it to the fine tuning of a handmade violin. In fact, I believe the head engineer or his son used to build violins. I remember he had quite the trained ear and could tell if the amount of stuffing wasn't precisely correct. I may post photos if I ever see any response on here. I was considering selling and still might but now my son thinks he wants to keep them so I'm not sure. I found what appears to be actual logo plates on Ebay and may purchase while they are still available. I'm curious if anyone knows approximately how much they are worth. It would be hard to part with them as they bring back memories and I'm proud of the fact that I know I had a lot to do with the building of these particular speakers. Anyone still out there? Only posting here to make sure I'm notified as I didn't click on that tab when I wrote above. So nice and interesting your story at Cizek factories. Actually i have at home one pair of Model I, 2 pairs of Model II, 4 pairs of Model III and one pair of MG27 that need to be restored. I'm looking since few years for the original spec of the MG27 voicecoils and also for the right spiders. traitement done at Cizek factory and i will be happy if you will help me to find more details about that. Please do post pictures. And I love to read stories like yours. I'm probably the seller of the logo plates you saw on ebay. They're not originals, they're reproductions and not perfect duplicates but they look pretty good. If you PM me through this forum I'll give a CSP discount on the ebay price. I'd really like to find the matching subwoofer! I also have a set of later Cizek HTA sub/sats. It's funny there isn't much interest in Cizek here in the USA but there are many fans in Italy! I'll bet you hear from other Italian members. Paolo Lippe is a real fan. Hi there Sergiopx and JKent and anyone else that happens to fall upon this. It's so nice to see such interest in these. Here are some shots of my babies. Those woofers were a gorgeous! It sure would be nice to have one to complement the speakers. I have to say for small speakers in KA1's can handle the base fine to my ear. At the time most speakers were huge so these beauties were somewhat of a breakthrough in the industry which got them the coveted cover on Hi-Fidelity. I was told it was difficult to get enough koa wood to have them built. We just couldn't get enough stock of the cabinets so they are very rare. I remember being told the problem was the koa trees only grow so big. Then they stopped harvesting the wood altogether for conservation reasons. I remember waiting for orders to come in on a very slow container and management being disappointed when it arrived with back orders on them. The orders just couldn't be filled. It was a small company with the usual cash flow problems so we might order only a small amount and just a few would arrive. The rest would be back-ordered for quite a long time. I contemplated buying one but just didn't have the money or space in my tiny apartment at the time. Thanks for the welcoming response. Do you have specs for the KA1's? Being decades old, the paper and foam have pretty much disintegrated. I'm afraid to even touch them. At one point I replaced one of the woofers but I don't even know which one it was as it was ages ago. I'd have to replace the tweeters and woofers and have no idea where to begin which is why I thought of selling them. Those are beauties! Any chance you still have the original woofer? My first pair had a damaged woofer cone so I sent both woofers to Bill LeGall, speaker guru extraordinaire, and he did a great job of rebuilding both at a very reasonable cost http://www.millersound.net Unfortunately, if you only have one they will both have to be replaced with some other woofer and they will no longer be Cizeks. Maybe someone would want to buy them for the cabinets. The pic below is of some so-called KA-1s that were offered on ebay. I was horrified when I first saw them but if the old drivers were shot but the beautiful cabinets were still good.... I suppose it's one way to go. If you decide to sell, please consider listing them in our For Sale section here. Thanks. They really are pretty but sadly just a decoration at this point. I love the ripple effect on the tops. I wish I had kept the woofer, but nope. Cizek had closed by then so I didn't think there was anything else I could have done. I think the original one is in better condition than the replacement one installed when they were 10-20 years old and it's twice as old as the replacement. They just don't build things like they used to. I had brought the woofer to a local electronics place that I trusted many years ago. We spent some time trying to match the specs as close as we could. I'm pretty sure they just tossed it. They're closed now too and I'm not in New England anymore. Other than removing speakers and reconnecting the wires, I'm not electronically inclined enough to attempt much rebuilding like you did. I'd hate to purchase the speakers and find out the crossovers are bad or that they just don't sound good. Although I know I personally tested each component and soldered them, they're still 40 years old so who knows what time could have done to them. I have some tung oil and could easily give a few refresh coats. That wood is so good, they hardly need it. There's a couple little dents on the side of one but no where near some that we sold that had little areas filled. You're the best for sending the links. Thank you! If I decide to sell, I'll certainly put on your site. They're a bit sentimental to me so might be hard to part with. I appreciate all your advice. Do you know of any other woofers that would work? DO you think I should replace both or rebuild the Cizek one and replace the other? Perhaps I'll contact Miller Sound when I get around to it. I also don't have the foam grills that were made for them. They turned into crumbs just from age. The cloth ones that I put on them may change the sound a bit but it was the best I could do and they look pretty neat. Yeah, I saw those odd speakers last night. Crazy, huh? Did they attempt to add mid-range speakers to them or is that just holes in the front panel? They don't look anything like the originals. You did such a spectacular job refinishing yours I'm impressed. Not speakers but check out this koa wood on the guitar. i like to be in touch with other Cizek lovers since many years and actually i can say that the one most expert and specialist in order to rebuild a pair of KA1 giving back to you the original sound is my friend Viljian living in Slovenia. He really know in the deep all details and secrets of Cizek magic circuits and components. Don't sell your KA1 pair cuz can really get back the original sound. I try to involve Mr. Viljian on this post if you agree. Thank you Sergio. I really appreciate that tip and would love to hear them again, but Slovenia? I'm in USA. I'm sure you know how heavy they are between the solid wood and magnets in the woofers. I imagine it would cost a small fortune to ship there and back again in addition to the cost of parts and labor. Sadly, I don't think I could afford it. I'll see if my son is interested in that but it's not likely he'll feel ok about sending to another country. I can dream about it. LOL. I don't know of other woofers that would work but that's where Bill may be able to help. He's a speaker wizard. If he doesn't have a single Cizek woofer to sell you'll probably have to replace the pair. They're 4 ohm, which makes it a bit trickier. Call him (don't email). He's a very good guy and will answer your questions. If you go back to the thread I linked above you'll see several pics of the fronts of the woofers. Below is a pic of the back, with its massive magnet. Looking at yours, the one on the left appears to have a plastic cone, so that's not original. The one on the right looks like it's paper but the dust cap is domed. All 4 of my woofers have flat dust caps. You may have to pull the woofers to check. The cloth grilles are unlikely to have a negative effect. After all, nearly all speakers have cloth grilles. Regarding the odd speakers, no--they did not attempt to add a mid. That's a port and it's a legitimate design but NOT anything like the original Cizeks (and AR, KLH, Advent, Boston Acoustics, etc. etc.) 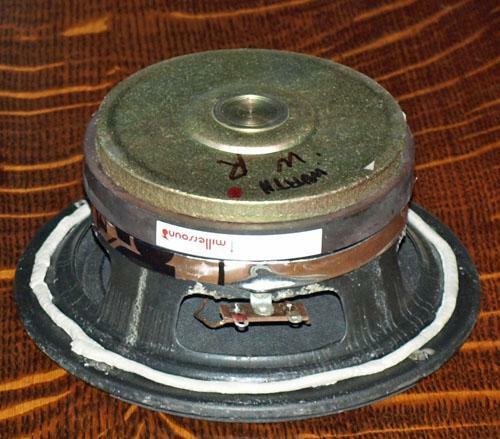 which were sealed acoustic suspension speakers. I'm guessing the builder of those just liked the koa wood cabinets. The front baffle does not look home-made so maybe he took an existing speaker of similar size and just transplanted everything to the Cizek cabinets. Yeah, I see the difference in the caps now that you point it out. Thing is, I don't remember changing both woofers but I don't remember the caps being domed either. I know my serial numbers are in the 500's so maybe something had changed. It's a mystery. I agree the plastic cone is definitely not original. It's funny, looking at the crossovers. I actually could have put those exact ones together 4 decades ago. Small world.